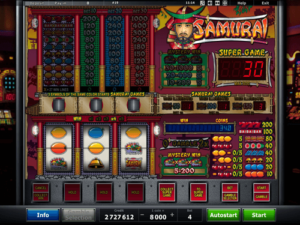 Samurai is an unusual slot from Novomatic. It’s unique because it’s one of the very few retro-style online slots that doesn’t have a fruity theme. Although there are fruit symbols in this game, the main theme is Asian. Samurai ruled over Japan for almost 700 years. These Japanese warriors were most prolific in the Edo Period, when they were at the top of Japan’s social hierarchy. This period in Japan’s history lasted from the beginning of the 17th century to the middle of the 19th century. Samurai warriors were fierce warriors who fought with swords but also with spears and bows and arrows. They lived by strict rules and discipline, and were respectful and behaved ethically towards others. The samurai wore very distinctive armour and helmets, which the samurai in this game can be seen wearing. Each part of a samurai’s armour had a specific name and design. Samurai from Novomatic will appeal to any slot player who has an interest in Japanese history or culture. In contrast to many modern online slots, Samurai is laid out to look like a physical slot machine. To play Samurai for real money, sign up at a Novomatic casino. These are online casinos where you can play Novomatic games! If you can’t decide which one to pick, consult our expert reviews for some unbiased advice and information on each Novomatic casino. Samurai has a base game and a top game. To play the top game, you will need to start with the base game and win enough to trigger the top game by playing your winnings in the supermeter. If you don’t want to play the top game, that’s fine. You can set your wins to be added directly to your balance, instead of the supermeter. Before you play, you have to choose the value of a coin. All bets and wins in the Samurai slot are calculated in coins. The base game can be played with a bet of anywhere between 1 and 5 coins. The base game has one payline which pays when the same symbol covers the whole payline. There are three reels so that means the same symbol must land on the middle position of all three reels. 3 oranges pay 10 coins. 3 plums pay 20 coins, as do three bells. Three grapes pay 40 coins and the same goes for the watermelon. Three Samurai symbols pay 80 coins, three bar symbols pay 100 symbols and three red sevens pay 200 coins. In the base of this Novomatic casino game, there are ‘Hold’ buttons which you can use at any time. These will switch on automatically if a good combination lands on the base game reels. You can turn them off if you want, also. Three samurai coin symbols will award a mystery win, worth between 5 and 200 coins. Samurai has a top game, which players will definitely enjoy! To play the top game, you will need to have the Samurai on your side. Back when Samurai warrior were common in Japan, they would defend the people. In castles and castle towns, where they lived, they were the only citizens who were allowed to carry around a sword! When you trigger this, you get to play the Samurai top game which has 27 paylines, compared to just 3 in the base game! Bets for the top game are taken from the supermeter, instead of your balance. The supermeter balance is clearly displayed on the top right-hand side of the game – underneath the colourful Samurai logo. You can play the top game with a 10, 20- or 30-coin bet. The more you bet, the bigger the wins will be! You can gamble your wins in the top game, add them to the supermeter, or transfer your supermeter balance to your overall balance. If you enjoy a game like Samurai, why not try some similar games, also from Novomatic. These include: Power Joker, Random Runner, Simply Wild and Hot Shot.